Selecting a different office will move the display to that office. If you are producing an animation, this date specifies the end date of the loop. Time window around plot valid time to plot LSRs. Download GIS shapefile of current warnings and/or GeoTiff of NEXRAD base reflectivity. This application is educational grade and should not be used operationally. 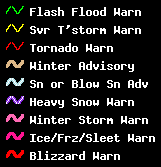 Flash Flood Warnings (FFW) do not have VTEC IDs, so those columns are blank for FFWs. The status column is simply the status of the warning. The warning is in 'NEW' state until a SVS is issued, then it goes to 'CON' for continued. Warnings identified by WFO are available after 29 Aug 2004. NEXRAD composite is available since 1 Aug 2003. Prior to the NWS adoption of VTEC, warnings were not expired nor canceled. SVS updates were added in 2005. LSR archive begins 1 Jan 2004. Archive of watches begins 1 Jan 1997.